GL's Dual T1 E1 Express (PCIe) Cards are high-density boards with newer PCIe bus interface. These cards are identical to the portable tProbe™ units, except for FXO FXS and Datacom functionality. 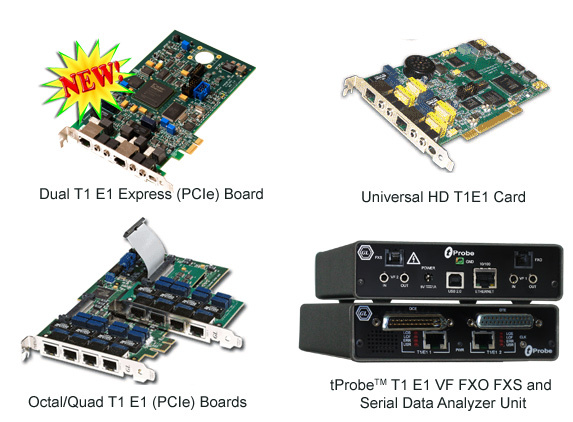 In addition to the other basic T1 E1 line signals monitoring applications, the Dual T1 E1 Express (PCIe) Boards also support enhanced VF drop and insert capabilities with software selectable VF Tx and Rx impedances (135Ω, 150 Ω, 600 Ω, 900 Ω, or High), Pulse Mask Compliance Testing, Jitter Generation and Measurement applications. This application allows the user to generate a jittered output T1 E1 signal with user-selected jitter frequency and amplitude. It is suitable for testing jitter tolerance and compliance with standards such as G.823. In conjunction with GL'sJitter Measurement application, Jitter Generation may also be used to test jitter transfer. GL's Message Automation & Protocol Simulation (MAPS™) is a multi-protocol, multi-technology platform used for the emulation of a variety of communication protocols over IP, TDM, and Wireless networks. Recently, CAP (CAMEL Application Part) emulation capability has been added. CAMEL stands for Customized Applications for Mobile networks Enhanced Logic. GL's MAPS™ CAP Emulator can emulate CAP IN services such as unified messaging, prepaid, toll-free, and fraud control. These services are available in TDM based GSM, GPRS and UMTS networks. They are also available for these same protocols over IP networks. CAP information flow is defined between functional entities such as Service Control Function (SCF) and Service Switching Function (SSF). 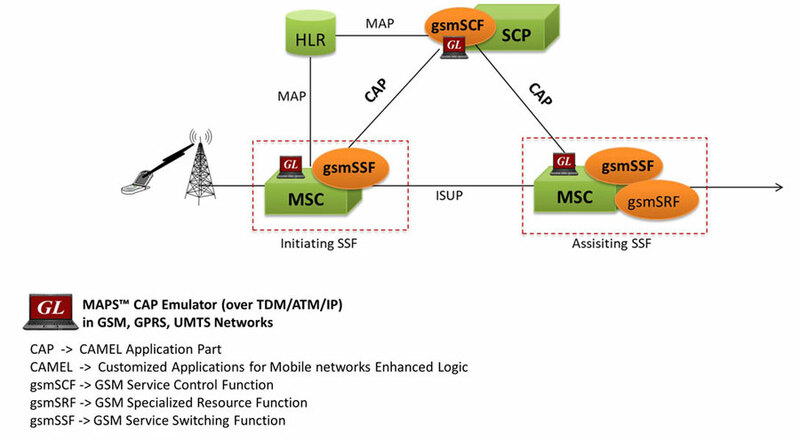 MAPS™ CAP Emulator can be configured as SCF and SSF entities in GSM, GPRS and UMTS networks to emulate CAMEL services. It is suitable for controlling telecommunication services such as Toll-free call flow, Apply Charging, Connect to Resource, Low Balance, and Establish Temporary Connection over TCAP layer. GL's MAPS™ FXO FXSis an advanced test tool that supports emulation of functions of Foreign Exchange Subscriber (FXS) by analog phone lines and Foreign Exchange Office (FXO) by phones using the FXO and FXS ports on a tProbe™. MAPS™ provides a facility to place call/answer incoming call on both FXO and FXS ports, and automate the entire testing process using scripts. MAPS™ scripting architecture is event-driven and provides the flexibility to validate the signals being exchanged during a call setup. MAPS™ also includes features to handle different types of traffic like tones, digits (DTMF, MF, MFR2F, MFR2B), voice files, fax, and more. Data width of the traffic being sent/ received over the FXO/FXS ports can be extended up to 16 bits to improve signal to noise performance. HDL File Conversion Utility has been added for all analyzers. Available in T1 E1, T3 E3, LightSpeed1000™, and PacketScan™ applications. The application allows to convert a file from Ethereal format files (.PCAP, .CAP, and .PCAPNG) to GL proprietary file format (.HDL) and vice-versa. With new release, a protection for disconnect is added so that the profiles do not corrupt, and next application initialization will produce expected results. WCS task commands now recognize an optional signal format clause. This clause will carry values that indicate byte order, sample rate, and encoding. At the moment, the monitor tones command is the only command that recognizes the optional signal format specification. WCS includes new commands "get fxo/fxs in/out gain" commands to report gain values from FXO ports. The WCS now understands byte ordering of linear signals. The options are big endian and little endian (the default). These options may be alternatively specified as motorola and intel respectively. In addition to bridge mode, the Multi-link Frame Relay Emulator now supports routing mode for emulating network traffic for single or multiple NIC cards. MLPPP Emulator supports Link Quality Report (LQR) protocol and two new authentication protocols, viz., Password Authentication Protocol (PAP) and Challenge Handshake Authentication Protocols (CHAP). MLPPP Emulator allows user to control the bandwidth either by choosing Flags between frames or by specifying the Link Utilization value in percentage. The new RECORD_PCM option in fax simulator application enables user to record the signals being exchanged during the FAX call setup as per the CODEC_TYPE settings. Two files corresponding to signal transmitted and received on the timeslot will be recorded with file names having port number timeslot and timestamp of the recording. Fax simulation can also be integrated with MAPS™SS7, MAPS™ ISDN, MAPS™ GSM application to simulate fax over SS7, ISDN, and GSM networks. The change in the algorithm implements more efficient circular buffer processing. The new trace file format (*.HDL) allows the use of larger files and more efficient use in Windows® 64-bit OS platform. HDLC Impairment Utility - The HDLC frames on T1 E1 lines can be impaired manually, or automatically at a specified random rate, e.g. 1x10E-04, or one in 10,000. Added a new layer called IPSec to PPP stack. This includes Authentication Header (RFC 4302) and Encapsulating Security Payload (RFC 4303) over IP layer. MAPS™ now includes FAX traffic simulation support for TDM based protocols - SS7, ISDN, and GSM. MAPS™ scripts, being event-driven, supports capturing of various types of FAX events related to transmission and reception status, data rate information, and any error that occurs during the fax session. MAPS™ also supports user-defined statistics feature that allows the users to customize the statistics display as per the test requirements. With this option users can count the number of times any event is executed, or count the number of times a specific protocol message is sent or received. In addition to the above, there have been several modifications and bug fixes to the T1 E1 Software. For more details, please refer to the link what's new in the current version web page.